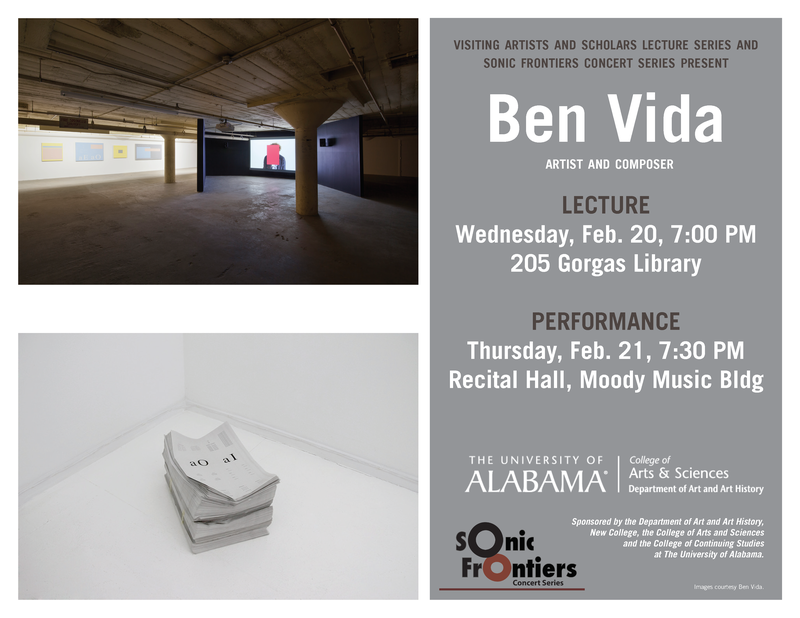 The Visiting Artist and Scholar Lecture Series and Sonic Frontiers are proud to present renowned visual artist and composer Ben Vida in two appearances. Vida will deliver a public lecture Wednesday, Feb. 20, 2019, at 7:00 p.m. in Gorgas Library 205 and give a performance Thursday, Feb. 21, 7:30 p.m. at the Recital Hall of Moody Music Building. Sonic Frontiers is a cutting-edge concert series of innovative and experimental music that enriches the cultural life of West Alabama and invites creative exchange between world-class performers of adventurous music, students, and the greater community through public performances and lively post-concert discussions. The 2018-2019 season is the ninth and final season for Sonic Frontiers. All Sonic Frontiers events are free and open to the public. For more information:http://sonicfrontiers.ua.edu. Intrinsic to our mission of outreach to the university community and beyond, the Visiting Artist and Scholar Lecture Series works in conjunction with the Paul R. Jones Collection of American Art, the Sarah Moody Gallery of Art, the Sella-Granata Art Gallery and other UA departments, organizations and individuals to bring to campus vanguard artists and scholars who represent the entire spectrum of art. To see past and future visiting artists and scholars, go to:https://art.ua.edu/resources/visiting-artists/.